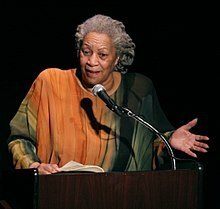 Toni Morrison (ibi Chloe Ardelia Wofford ni February 18, 1931) je olukowe, olotu ati ojogbon omo ile Amerika ti o gba Ebun Nobel ati Ebun Pulitzer. ↑ Duvall, John N. (2000). The Identifying Fictions of Toni Morrison: Modernist Authenticity and Postmodern Blackness. Palgrave Macmillan. p. 38. ISBN 9780312234027. http://books.google.com/books?id=iHbeC1I_aWUC&pg=PA38. "After all, the published biographical information on Morrison agrees that her full name is Chloe Anthony Wofford, so that the adoption of 'Toni' as a substitute for 'Chloe' still honors her given name, if somewhat obliquely. Morrison's middle name, however, was not Anthony; her birth certificate indicates her full name as Chloe Ardelia Wofford, which reveals that Ramah and George Wofford named their daughter for her maternal grandmother, Ardelia Willis." Àtunṣe ojúewé yi gbẹ̀yìn wáyé ni ọjọ́ 24 Oṣù Kẹrin 2015, ni ago 23:29.